Welcome to Worthy, where we help you sell Rolex Oyster Perpetual Datejust watches. 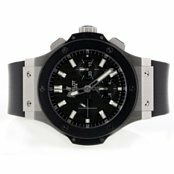 These luxury watches deserve worthy offers, which is precisely what you’ll receive when you choose to work with us. 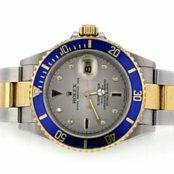 Using our unique auction platform, we attract hundreds of professional buyers to compete for your Rolex Oyster Perpetual Datejust watch. We go beyond simply listing your timepiece, by cleaning, evaluating, and photographing it using the most technically advanced high-resolution imaging equipment available, so it looks its very best at auction. From start to finish, we are fully committed to obtaining the highest price possible and to ensuring the process is simple and secure. 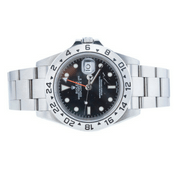 Why Sell Rolex Oyster Perpetual Datejust Watches With Worthy? We believe convenience is of great value and we prove it by working diligently on your behalf. With our services, there’s no need for you to spend valuable time searching for an evaluator, cleaning and photographing your watch, then attempting to connect with interested buyers. Because we often sell Rolex Oyster Perpetual Datejust watches, we attract interested, pre-screened buyers to your auction, selling only to those who are willing to pay top dollar for the quality and reliability associated with Worthy. Our top values including trust, transparency, and total customer satisfaction. It all starts with a 100% objective evaluation and continues throughout the entire auction process. Worthy holds a Secondhand Dealer's License issued by the New York City Department of Consumer Affairs and is accredited by the BBB. 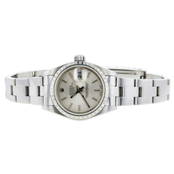 Those who sell Rolex Oyster Perpetual Datejust watches with us benefit in a number of ways. One of the biggest benefits we provide is a professional watch authentication, which is conducted at no cost to you at CentralWatch, located in Manhattan. We only trust watch experts that are at the top of their field. You can also enjoy peace of mind in the knowledge that your Rolex is fully insured throughout transit and during storage in our ultra-secure facility. Description. Describe your Rolex to the best of your ability. Be sure to include mention of any paperwork you may have. Reserve Price. The experts at CentralWatch will examine your watch and compose a detailed report on it. 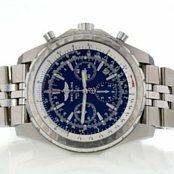 We then take HD photographs of your watch to display at auction. At this stage you are given the opportunity to set a minimum reserve price. Auction. Buyers are invited to view and place competitive bids on your watch. 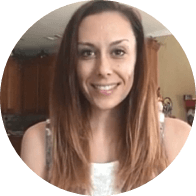 If the highest bid meets or exceeds the reserve price, the sale is confirmed and the money is sent to you. 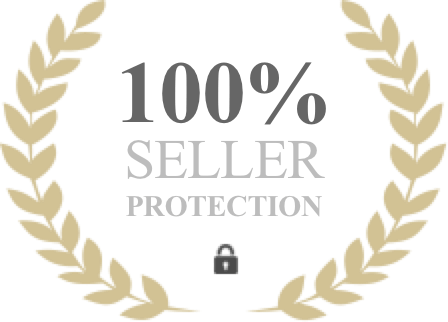 If the auction ends below the minimum price, you have the option to decline the sale and we will return your watch to you fully insured, free of charge. Not only are Rolex Datejust watches popular with pilots, they appeal to timepiece connoisseurs worldwide. Like other popular Rolex models, the Oyster Perpetual Datejust is available in several designs suitable for men and women. There are numerous colors and styles available, with many sporting fine diamonds and exquisite bracelets. What Factors Can Affect the Value of a Rolex? Those who buy and sell watches, particularly those that sell Oyster Perpetual Datejust models are familiar with factors affecting their value. These include: age, rarity, condition, and popularity. Rarity and popularity are factors that are not in your control, however it will help that you maintain your watch and keep it in good condition no matter the age or level of use. All luxury watches require annual maintenance and checks that should be in place before something goes wrong. This will make a significant difference in the selling price of your timepiece. 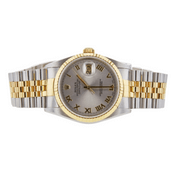 Why do our clients choose Worthy to sell Rolex Oyster Perpetual Datejust watches? Excellent examples of Rolex Oyster Perpetual Datejust watches have recently sold for well over $25,000 at auction. If you’d like to sell a Rolex, you’ll most likely be astonished at the offers you receive when working with Worthy.